Brazilian aerospace company Embraer has announced plans to leverage a joint venture with Boeing to introduce the KC-390 transport aircraft to other markets in a bid to increase the aircraft’s sales, Flight Global reported Thursday. 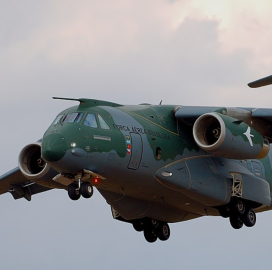 Embraer said at a recent investor conference that it intends to take advantage of Boeing’s international sales and marketing network to reduce costs of the parts and components of the KC-390s. Nelson Salgado, chief financial officer of Embraer, said the company aims to compete with Lockheed Martin in the markets where the U.S. currently has “huge geopolitical influence.” Lockheed’s C-130 Hercules reportedly held the largest piece of the global military transport market in 2018 with 878 active aircraft. He said that Boeing’s leverage on the supply chain can reduce costs and make KC-390’s more competitive. Salgado noted Embraer already has the license to market the transport aircraft worldwide exclusively. The company is expected to invest not more than $100M in the production of the KC-390s, according to Salgado.